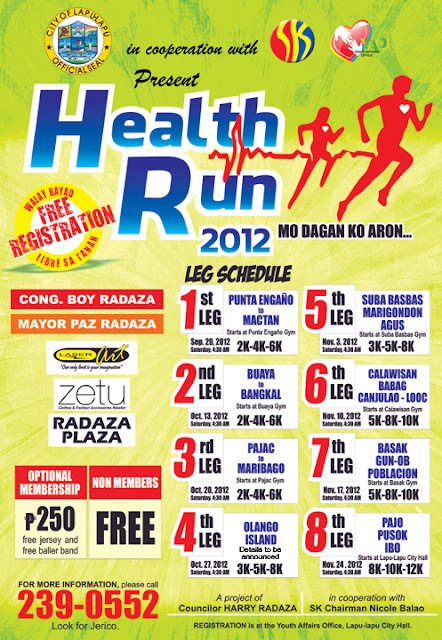 The Lapu Lapu City Health Run 2012 is scheduled to start on September 29, 2012 and the last leg will by November 24, 2012. Registrations are now accepted at the Youth Affairs Office in Lapu-Lapu City Hall Compound or Call 239-0552 directly. Registration fee is free but an option for race jersey or singlet and baller bands are available by paying registration fee of 250 pesos. The Lapu-Lapu Health Run Race Route is designed to cover major roads within the City Barangays so every Oponganons are encourage to join and stay fit. For Lapu Lapu Health Run Race Categories, please refer to the official Race poster. The Lapu-Lapu Health Run is presented by Lapu-Lapu City. This is a project of Sports and Tourism Chairman and Lapu-Lapu City councilor Harry Don Radaza in cooperation with LLC SK Officials and Youth Affairs Office. 2 comments: on "Join the Lapu Lapu Health Run 2012 and stay Fit"